8 Comments Published by Cedric Benetti on Friday, November 28, 2008 at 11/28/2008 05:35:00 PM. 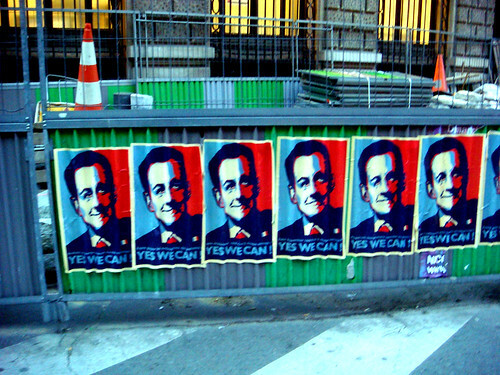 On the night between November 26th and 27th, some mysterious group pasted numerous hundreds of posters in some streets of Paris, depicting the colorful face of Sarkozy in the now mythical Obama campaign style. 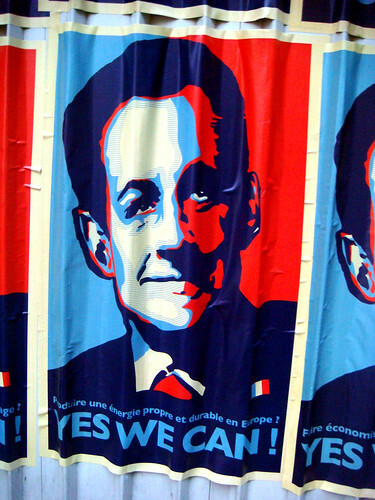 The posters have different slogans ranging from "Producing a clean ecological source of energy" to "Create one million fixed jobs", followed by a big "Yes we can!" 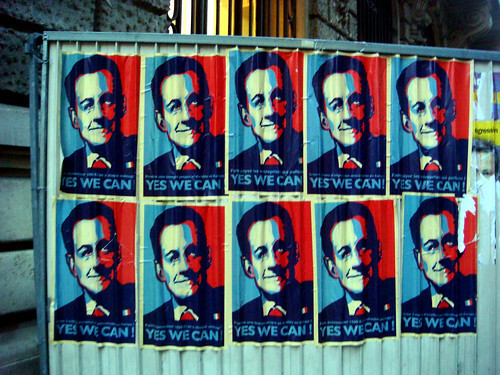 Interstingly the areas the posters can be found (the pictures here are taken next to my apartment in the second arrondissement) are all strong voters of the political left, such as the Marais, Bastille, Republique and other parts of the city. even more ironic is that the americans have been plundering french cinema for years and at least the french had the high ground in politics. oh well egalite and all that! voila!, the twisted little gnome of le grande paris!... sorry..